(Francisco Kjolseth | The Salt Lake Tribune) Cathy Jones, left, takes advantage of extreme markdowns on the last day of business at Wasatch Shadows Nursery in Sandy as owner Debbie Nielsen rings up her purchases. After 42 years, Debbie and her husband Loren are retiring. They had the most unique items here and knowledgeable staff, exclaimed Jones while picking up several items on the last official day of business. 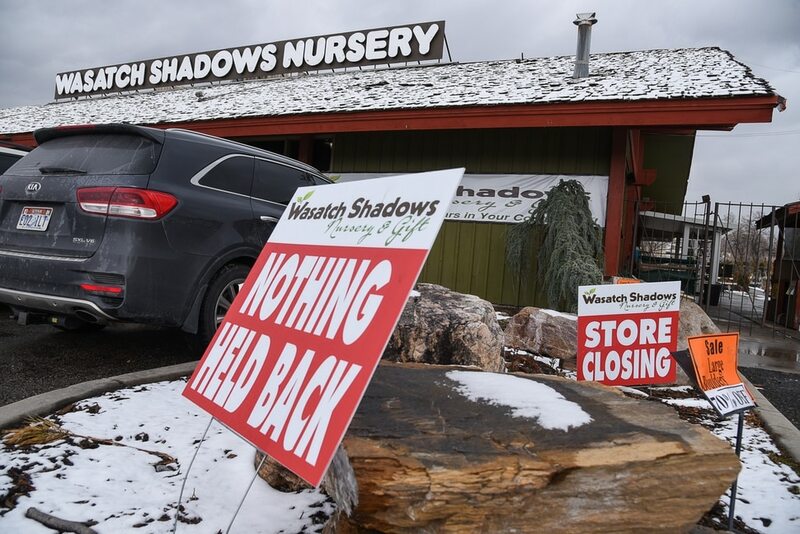 (Francisco Kjolseth | The Salt Lake Tribune) Wednesday marks the last day of business for Wasatch Shadows Nursery in Sandy. After 42 years, owners, Loren and Debbie Nielsen, are retiring. They have sold the 10 acre plot, just west of the Real Soccer Stadium, to Sandy City for future development. (Francisco Kjolseth | The Salt Lake Tribune) Shelves are cleared Wednesday the last day of business for Wasatch Shadows Nursery in Sandy. After 42 years, owners, Loren and Debbie Nielsen, are retiring. They have sold the 10 acre plot, just west of the Real Soccer Stadium, to Sandy City for future development. 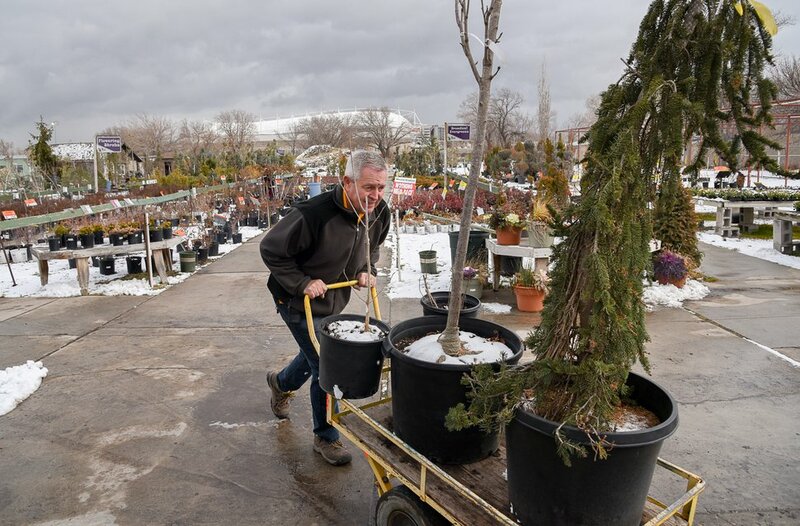 (Francisco Kjolseth | The Salt Lake Tribune) Wednesday marks the official last day of business for Wasatch Shadows garden and landscape center in Sandy. After 42 years, owners, Loren and Debbie Nielsen, are retiring. They have sold the 10 acre plot, just west of the Real Soccer Stadium, to Sandy City for future development. (Francisco Kjolseth | The Salt Lake Tribune) Debbie and Loren Nielsen, left, owners of Wasatch Shadows Nursery in Sandy, speak with customer Greg Roach on on the last day of business. After 42 years, the Nielsens are retiring. They have sold the 10 acre plot, just west of the Real Soccer Stadium, to Sandy City for future development. I'm sad to see it go. They always had some of the best prices and great variety, exclaimed Roach. (Francisco Kjolseth | The Salt Lake Tribune) Wednesday marks the official last day of business for Wasatch Shadows Nursery in Sandy. After 42 years, owners, Loren and Debbie Nielsen, are retiring. They have sold the 10 acre plot, just west of the Real Soccer Stadium, to Sandy City for future development. (Francisco Kjolseth | The Salt Lake Tribune) Wednesday marks the official last day of business for Wasatch Shadows Nursery in Sandy. After 42 years, owners, Loren and Debbie Nielsen, are retiring. They have sold the 10 acre plot, just west of the Real Soccer Stadium, to Sandy City for future development. 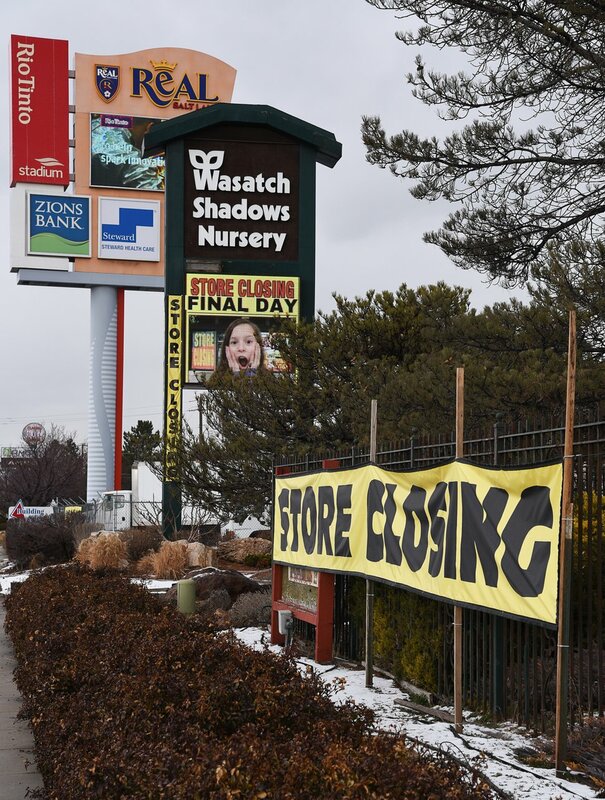 (Francisco Kjolseth | The Salt Lake Tribune) Wednesday marks the official last day of business for Wasatch Shadows garden and landscape center in Sandy. After 42 years, owners, Loren and Debbie Nielsen, are retiring. They have sold the 10 acre plot, just west of the Real Soccer Stadium, to Sandy City for future development. (Francisco Kjolseth | The Salt Lake Tribune) Wednesday marks the official last day of business for Wasatch Shadows Nursery in Sandy. After 42 years, owners, Loren and Debbie Nielsen, are retiring. They have sold the 10 acre plot, just west of the Real Soccer Stadium, seen in background, to Sandy City for future development. (Francisco Kjolseth | The Salt Lake Tribune) Rio Tinto Stadium looms in the background of Wasatch Shadows Nursery in Sandy. After 42 years, owners, Loren and Debbie Nielsen, are retiring. They have sold the 10 acre plot to Sandy City for future development. (Francisco Kjolseth | The Salt Lake Tribune) Brent Thurman takes advantage of clearance prices as Lilly Tafoya, an employee at Wasatch Shadows Nursery r in Sandy helps him load up his trailer. Wednesday was the last day of business after 42 years. (Francisco Kjolseth | The Salt Lake Tribune) Wednesday marks the official last day of business for Wasatch Shadows garden and landscape center in Sandy. After 42 years, owners, Loren and Debbie Nielsen, are retiring. They have sold the 10 acre plot, just west of the Real Soccer Stadium, to Sandy City for future development. (Francisco Kjolseth | The Salt Lake Tribune) Loren Nielsen, owner of Wasatch Shadows garden and landscape center in Sandy wheels trees out to a customers on the last official day of business on Wed. Dec. 12, 2018. Nielsen and his wife Debbie plan to stay until it is all gone with limited store hours. After 42 years the two are retiring. They have sold the 10 acre plot, just west of the Real Soccer Stadium, in background, to Sandy City for future development. (Francisco Kjolseth | The Salt Lake Tribune) Wednesday marks the official last day of business for Wasatch Shadows garden and landscape center in Sandy. After 42 years, owners, Loren and Debbie Nielsen, are retiring. They have sold the 10 acre plot, just west of the Real Soccer Stadium, to Sandy City for future development. (Francisco Kjolseth | The Salt Lake Tribune) Wednesday marks the official last day of business for Wasatch Shadows garden and landscape center in Sandy as a customers looks over the various plants with the Real Soccer Stadium in the background. After 42 years, owners, Loren and Debbie Nielsen, are retiring. They have sold the 10 acre plot to Sandy City for future development. 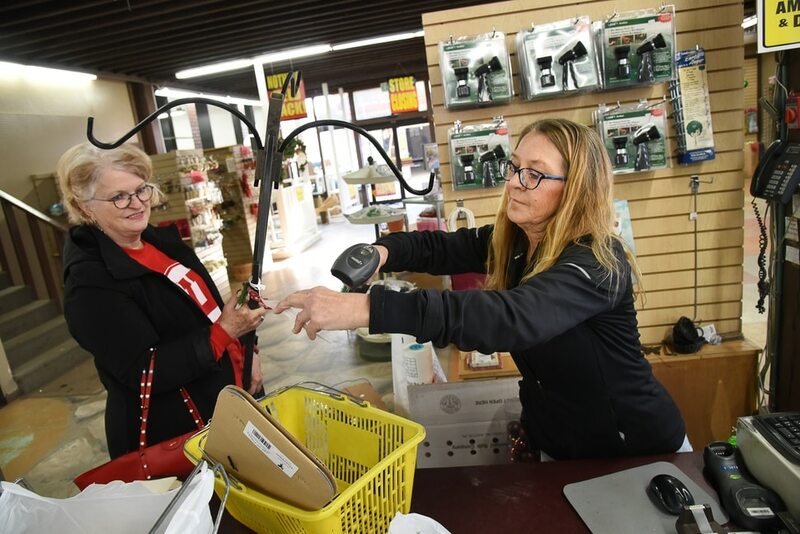 (Francisco Kjolseth | The Salt Lake Tribune) Stickers mark sold items as Wednesday marks the official last day of business for Wasatch Shadows garden and landscape center in Sandy. After 42 years, owners, Loren and Debbie Nielsen, are retiring. They have sold the 10 acre plot, just west of the Real Soccer Stadium, to Sandy City for future development. (Francisco Kjolseth | The Salt Lake Tribune) Wednesday marks the official last day of business for Wasatch Shadows garden and landscape center in Sandy. After 42 years, owners, Loren and Debbie Nielsen, are retiring. They have sold the 10 acre plot, just west of the Real Soccer Stadium, to Sandy City for future development. 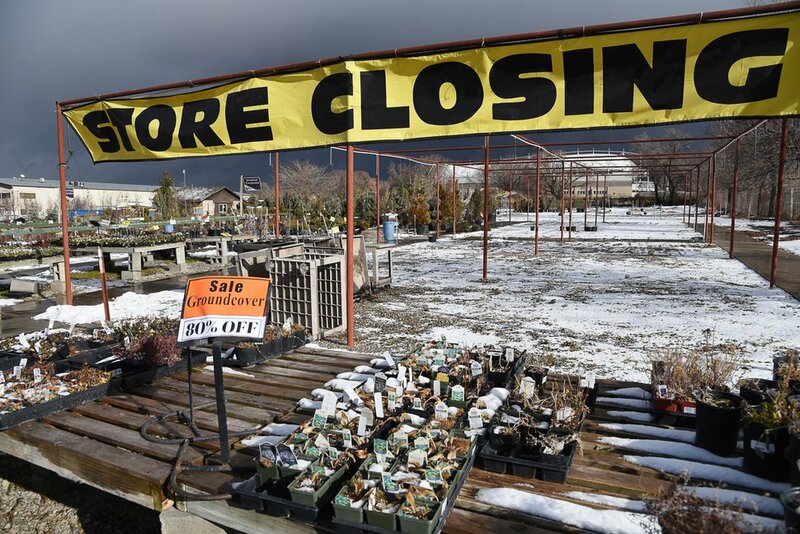 (Francisco Kjolseth | The Salt Lake Tribune) Wednesday marks the official last day of business for Wasatch Shadows garden and landscape center in Sandy. After 42 years, owners, Loren and Debbie Nielsen, are retiring. They have sold the 10 acre plot, just west of the Real Soccer Stadium, to Sandy City for future development. Sandy • Loren and Debbie Nielsen hung the yellow “store closing” signs in August, plenty of time — it seemed — to prepare for Wednesday’s final day of business at Wasatch Shadows Nursery. Still, as the couple stood among the empty shelves and 80-percent-off tags, they had mixed emotions about shutting down their well-known business, which has been rooted in the state’s gardening and landscape industry for more than four decades. A memory book inside the store is filled with customer good wishes — and laments — about the closure and the Nielsens' pending retirement. “We will miss your great store and especially your expertise,” wrote one loyal patron. “Where am I going to find the beautiful unique gifts for my friends and family?” asked another. Even people who have never shopped at the store at 9295 S. 255 West know the Wasatch Shadows name. The nursery’s catchy jingle was heard far and wide for decades on radio and television advertisements. (Francisco Kjolseth | The Salt Lake Tribune) Loren Nielsen, owner of Wasatch Shadows garden and landscape center in Sandy wheels trees out to a customers on the last official day of business on Wed. Dec. 12, 2018. Nielsen and his wife Debbie plan to stay until it is all gone with limited store hours. After 42 years the two are retiring. They have sold the 10 acre plot, just west of the Real Soccer Stadium, in background, to Sandy City for future development. Through the years, the Nielsens have been approached numerous times by companies that wanted to develop the 10-acre property, located immediately west of Rio Tinto Stadium and visible from Interstate 15. As the couple neared retirement age — in February, Loren and Debbie will turn 65 and 63, respectively — they finally agreed it was time to sell. Sandy is purchasing the property, but the city plans to keep it only temporarily, while it completes a master plan for the area known as Stadium Village. The first draft of the master plan should be introduced early next year, explained Nick Duerksen, Sandy’s economic development director. Various scenarios have been discussed for the property, including a mix of restaurants, retail, residential and parking options. 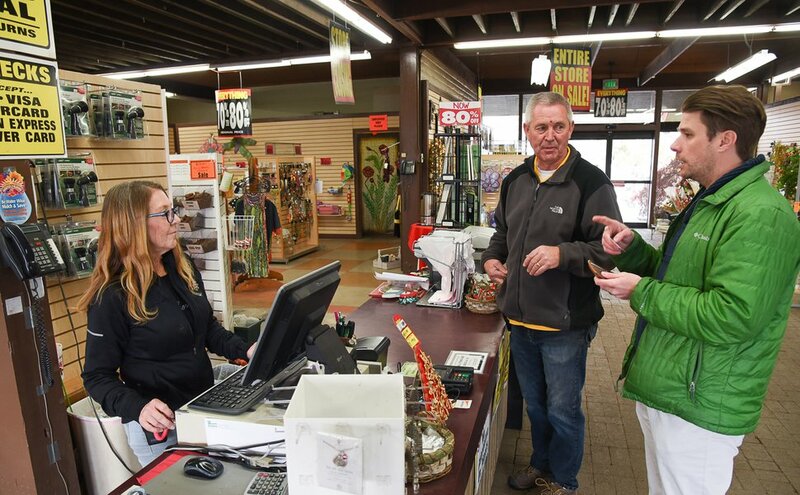 (Francisco Kjolseth | The Salt Lake Tribune) Debbie and Loren Nielsen, left, owners of Wasatch Shadows garden and landscape in Sandy speak with customer Greg Roach as he picks up several items on the last day of official business. After 42 years, the Nielsen's are retiring. They have sold the 10 acre plot, just west of the Real Soccer Stadium, to Sandy City for future development. "I'm sad to see it go. They always had some of the best prices and great variety," exclaimed Roach. Sandy resident Larry Seeborg also is sad to see Wasatch Shadows go — and not just because he will miss the gardening advice. “It’s been a shame to see open spaces once occupied by nurseries, fruit orchards and small farms disappear from the Salt Lake Valley,” he said. Seeborg fears the canal and trees, which separate the nursery from the stadium, will be turned into a parking lot for Real Salt Lake soccer fans. The Nielsens, who watched the stadium being built, said the venue has been both a negative and a positive. On one hand, it brings explosive traffic to the area on game days, but it also exposes the nursery to people from all over the valley. Loren said soccer fans would often come early to a game — to get a prime parking spot on the road in front of nursery — and then spend time shopping in the store before heading to the stadium. (Francisco Kjolseth | The Salt Lake Tribune) Wednesday marks the official last day of business for Wasatch Shadows garden and landscape center in Sandy. After 42 years, owners, Loren and Debbie Nielsen, are retiring. They have sold the 10 acre plot, just west of the Real Soccer Stadium, seen in background, to Sandy City for future development. Loren started working at Wasatch Shadows as a manager in 1976, when the original owner, Jack Johnson, opened the nursery. Back then, it was on a 1.5-acre plot on Highland Drive in Holladay, earning its name because it sat in the shadows of the Wasatch Mountains. After managing the store for 16 years, the Nielsens bought the business in 1992. Debbie, along with the couple’s five children and dozens of local employees, have worked at the nursery, known for its large selection of trees, shrubs, ornamental grasses and perennials. 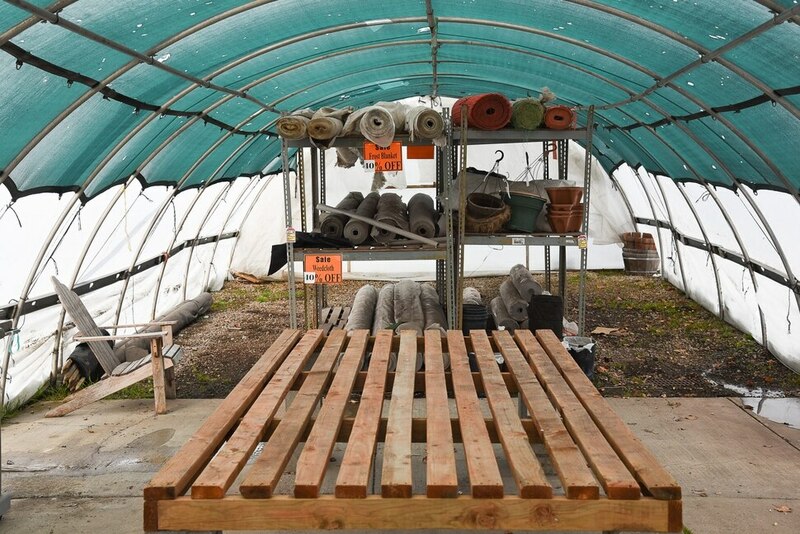 “We’ve tried to carry anything that our customers might want,” said Loren, who had no formal training in the nursery business. “I learned on the job,” he said, but he eventually got his nursery certification in 1980. He later became president of the Utah Nursery and Landscape Association. (Francisco Kjolseth | The Salt Lake Tribune) Wednesday marks the official last day of business for Wasatch Shadows garden and landscape center in Sandy. After 42 years, owners, Loren and Debbie Nielsen, are retiring. They have sold the 10 acre plot, just west of the Real Soccer Stadium, to Sandy City for future development. Faithful members of The Church of Jesus Christ of Latter-day Saints, the Nielsens decided early on to close on Sundays. People told him it would be his demise, but it only endeared him to the community and helped him attract employees who felt the same about working on the Sabbath. Of course, some of the plants still needed to be watered by hand on Sundays, so after church, Loren would come in, finding the solitary work “some of the most enjoyable." Until then, the couple seem satisfied with what they have accomplished at Wasatch Shadows.